We started The Left Handers Club back in 1990 in response to requests from customers to produce a newsletter and campaign on behalf of left-handers to get more products made and raise awareness of the issues facing left-handers – particularly left-handed children in school. We wrote an article recently on the lack of guidance on helping left-handed children given to teachers either while they are training or in schools. This generated a massive response showing widespread concern about this issue among children, parents and teachers themselves. 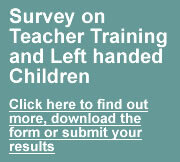 We are continuing with our work on this and are using the occasion of Left handers Day 2012 to raise awareness and pave the way for the survey we are planning for September 2012 and then issuing guidance for teachers and parents. We have been running a number of different surveys over many years and you can see the details of how to complete the questions yourself or see our results and analysis using the links on our left-handed surveys page. This survey is about which hand left-handers use for various activities, how left-handedness runs in families and how left-handers are affected by their hand preference. There are lots of great things about being left-handed, but it can sometimes be hard trying to learn to do something in a right-handed way or with right-handed tools. Nowadays, many schools are realising that it’s not fair to make us left-handers do things “back to front” and that left-handers deserve to be just as comfortable when they learn. There are lots of really useful left-handed teaching aids and equipment that are now available to schools, but some teachers still aren’t using them! That’s why we’re asking you to fill in this survey to tell us how well your school looks after left-handed pupils. We are undertaking the biggest ever survey of left-handedness in various Groups of people to find out what advantages and disadvantages left-handers have and how it affects their choices and success of career, sports, social activities and other lifestyle choices.